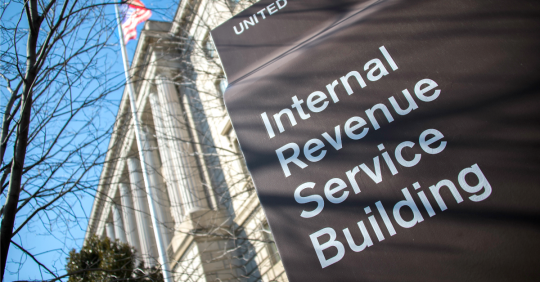 Glancing at the New York Times and CNN websites yesterday, you may have learned that the Internal Revenue Service changed a rule in a way that would benefit big conservative corporations. "NRA and some other nonprofits will no longer need to identify their donors to the IRS," reported CNN for example. Huh? Why the headline focus on the NRA, then? The headline could have just as easily read "NAACP and some other nonprofits" or "Planned Parenthood and some other nonprofits." There's no justification given in the article for the focus on the NRA in particular when we're talking about a rule that affects literally every 501(c)(4). Likewise, the New York Times headline reads "I.R.S. Will No Longer Force Kochs and Other Groups to Disclose Donors." Again, one only needs to get past the second paragraph to learn that thousands and thousands of organizations, including apolitical ones, are affected by the rule. The Trump administration will end a longstanding requirement that certain nonprofit organizations disclose the names of large donors to the Internal Revenue Service, a move that will allow some political groups to shield their sources of funding from government scrutiny. The change, which has long been sought by conservatives and Republicans in Congress, will affect thousands of labor unions, social clubs and political groups as varied as arms of the AARP, the United States Chamber of Commerce, the National Rifle Association and Americans for Prosperity, which is funded partly by the billionaire brothers Charles and David Koch. Notice that the political groups listed by the Times are "as varied" as a neutral political group, a conservative one, a conservative one, and a conservative one. Evidently the Times just couldn't think of a prominent liberal political organization! The Times does note that the Kochs cheered the rule change and "Americans for Prosperity and other 501(c)(4) organizations in the Koch brothers’ network of advocacy groups were among dozens of such nonprofit groups to sign onto a letter sent in May" calling for the rule change. But that doesn't explain singling out the Kochs in particular, as opposed to the other conservative groups or nonprofits that supported the rule change. The headline could have reported "I.R.S. Will No Longer Force American-Chinese Fellowship of Houston to Disclose Donors"– that group also signed the letter. The headlines go further than that and actively create a false impression. Imagine a headline reading "President Obama Urges Regulation of Republican Party, Others" on a story about Obama calling for generic campaign finance reform. The only reason to phrase a headline that way is to imply that the named group was specifically singled out by the action in question. When that isn't the case, you're lying to your readers, even if the headline is technically accurate. Trump and Republicans in Washington are making it deliberately effortless for dark money groups such as the Russia-linked NRA and wealthy Republican donors like the Kochs and Sheldon Adelson to further influence our elections. That's a lot of clicks, I bet! And all it cost was deceiving thousands. This entry was posted in Politics and tagged CNN, Koch Brothers, New York Times. Bookmark the permalink.